Are you less than slender? Or you simply want to wear a close-fitting frock? 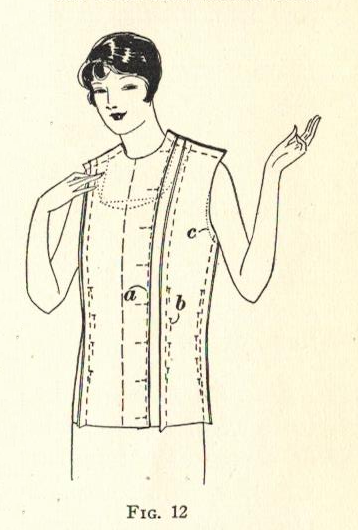 In the 1920s, the "stout" woman or those who wanted to wear something more snugly fitted, the close-fitting lining was the foundation garment required. The close-fitting lining (in contrast to waist linings and built-up linings) has lightly shaped seams along princess lines, and either a side-front or center front closing. 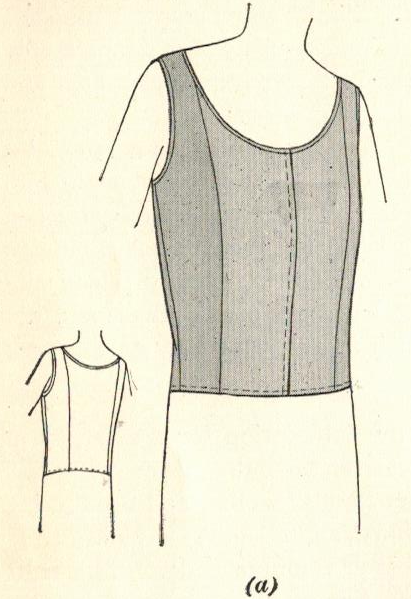 Like the camisole linings and built-up linings, the close-fitting linings have two lengths. When sewing your own close-fitting lining, start with a basic pattern. 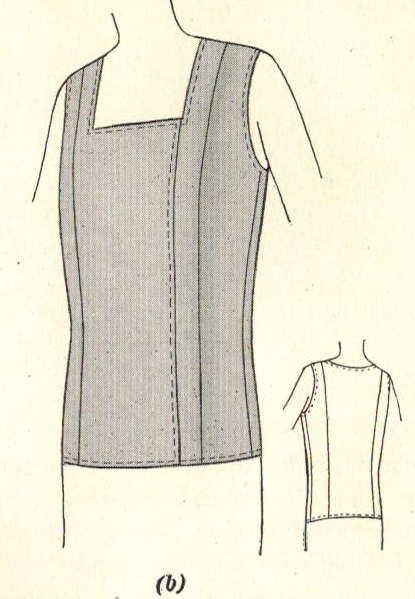 When fitting the sections of the lining by basting, fold and pin under the hem allowance along the intended closing, as at (a) in figure 12. If the lining is too loose, pin the seams deeper, as at (b) in figure 12. It is especially important in a close-fitting lining that the armholes be comfortably loose, since there is very little fullness or "give." So mark them where you think they should be trimmed deeper, as at (c) in figure 12. When sewing the lining, you would sew hooks and eyes 1-1/2 or 2 inches apart along the closing, and then use bias binding or narrow hems to finish the neckline and armholes. Was this fun? Next topic in this series - foundation slips!